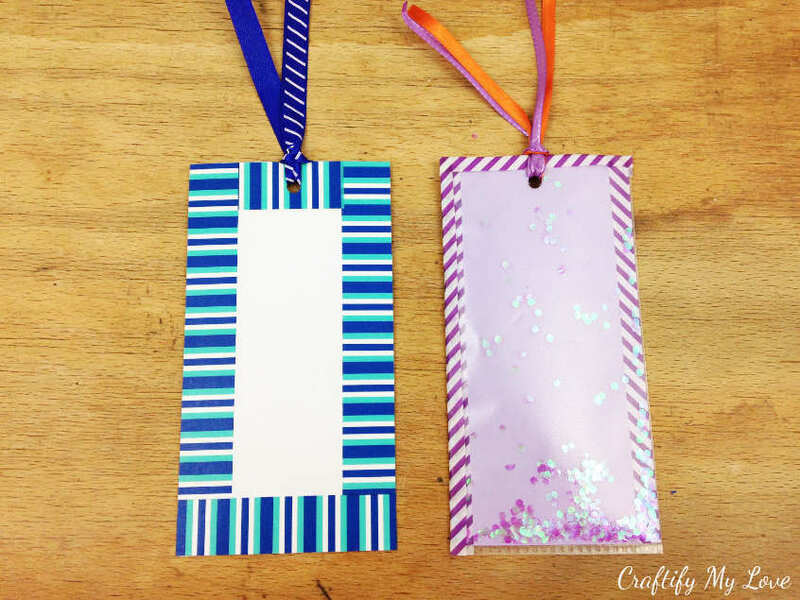 Learn how to make a memory keepsake bookmark from admission tickets. 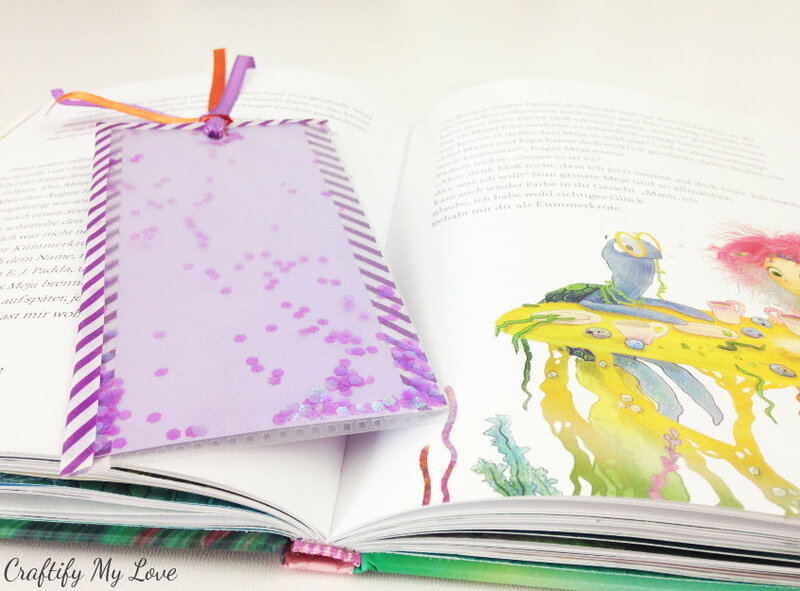 This purple & violet design is actually a bookmark in a glitter pocket for a little extra girly note. You will be using a power tool called a fuse. 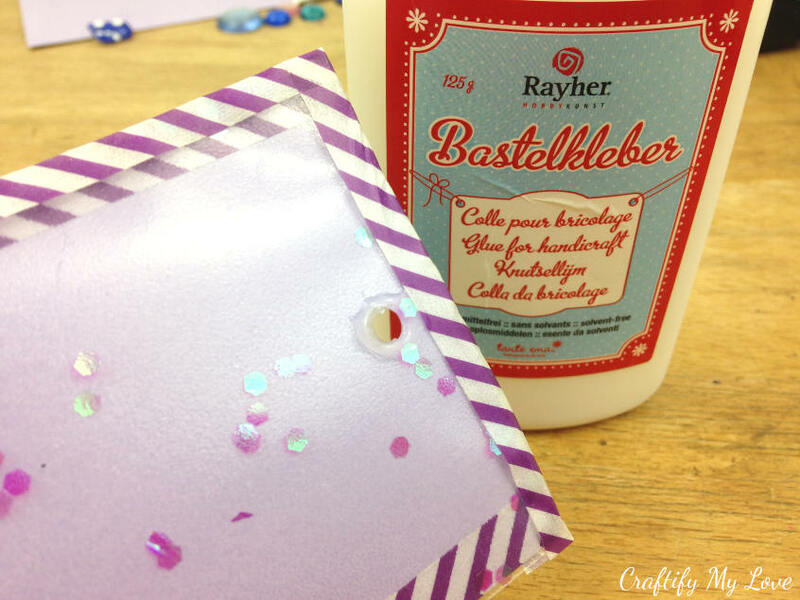 You might need to assist your children with this tool as it will heat up in order to melt the plastic into the glitter pocket. If you are working with very young children and rather not use this tool, check out the turquoise & blue design I’ve created here. 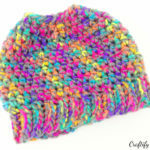 You can find the complete supply list for this project here. Place the entrance ticket on a piece of paper. I’ve used a violet cardstock my little god-daughter INSISTED I buy, lol. She loves herself some purple and violet and so this was the most perfect paper for her design. 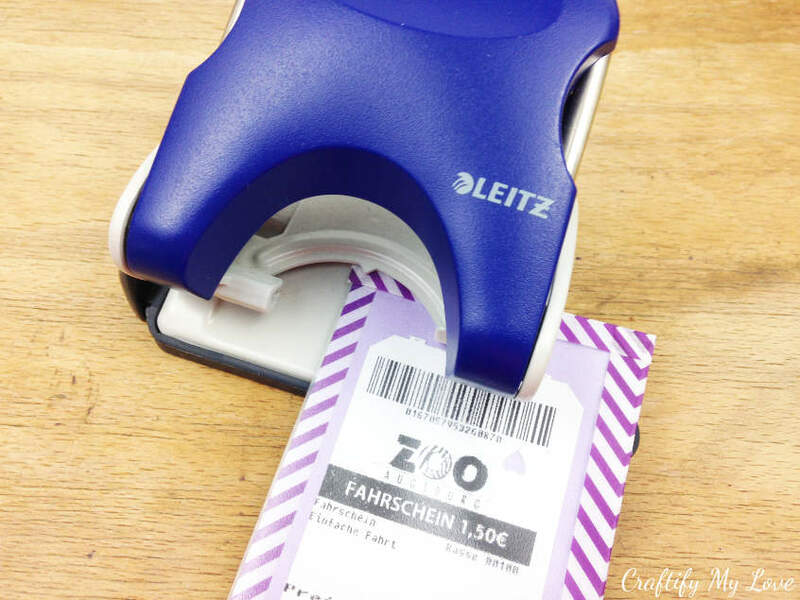 Make sure to have enough space around the ticket stub to decorate with washi tape later on. 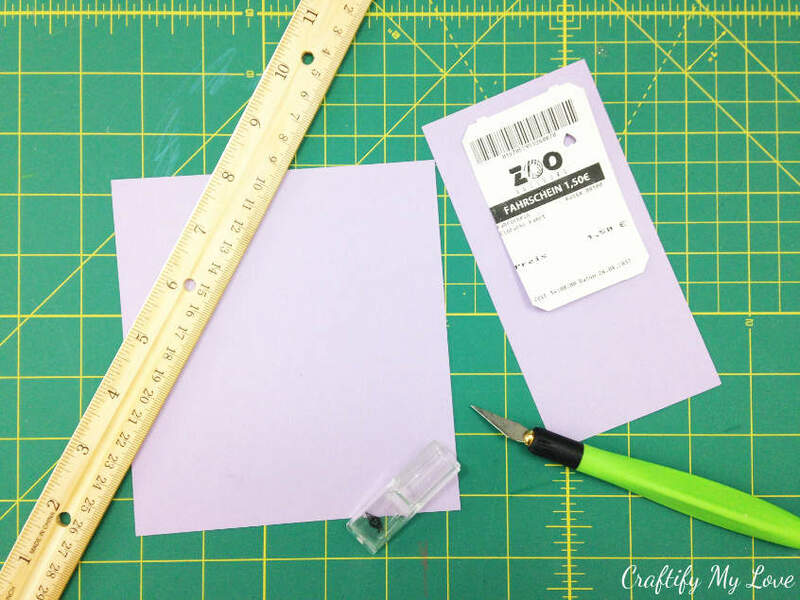 Either use a ruler and mark the cutting line or freestyle it when using a sharp knife or a paper cutter. Stick a photo to a wall or a piece of furniture. 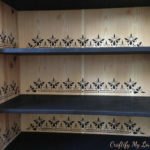 It looks super decorative if you give the photo a ‘frame’ of washi tape and if you take it off again, no harm will be done to the wall or furniture. 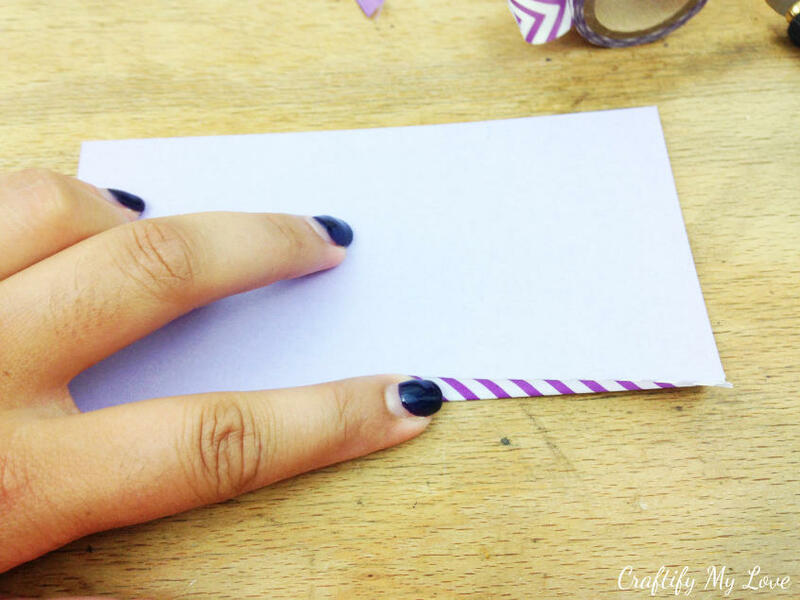 I use it instead of tape: Seal an envelope with it for extra fun. Stick a to-do list to your memory board. Or that grocery list to the fridge. 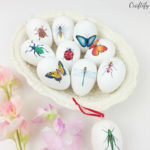 I use it as design elements in my crafts projects. Wrapping gifts with washi tape and just simple brown paper is super fun. 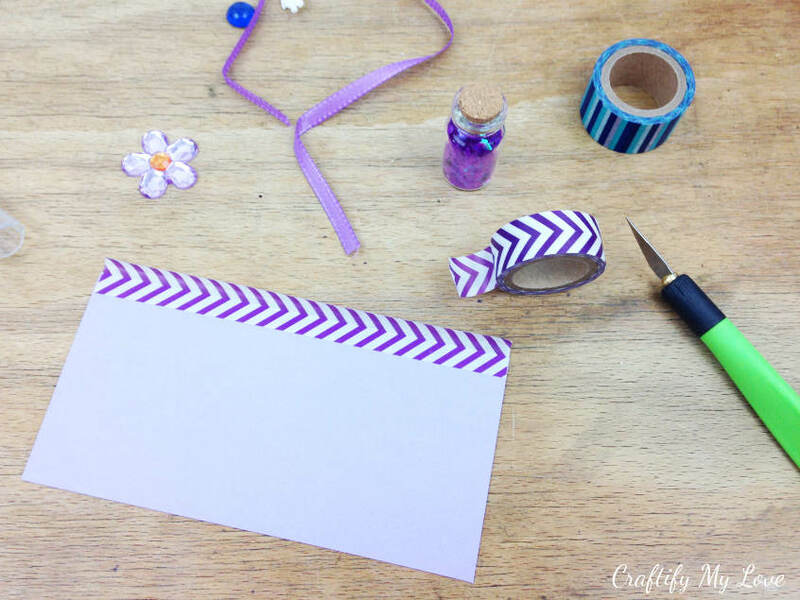 … turn your bookmark around and bend the washi tape over. 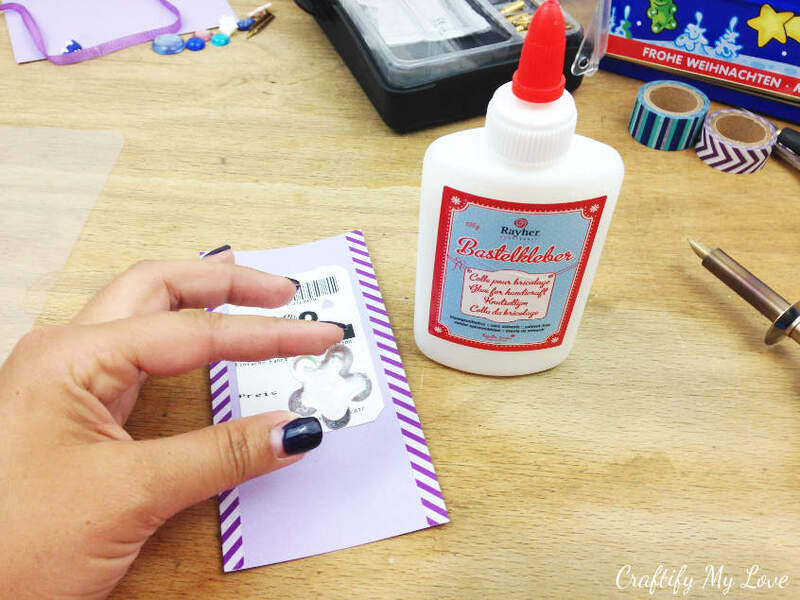 I’d recommend you use a glue stick for the ticket and any kind of all-purpose crafting glue for other embellishments. My god-daughter loves herself some sparkle, so I chose a rhinestone flower. 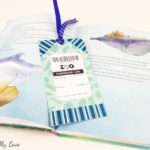 If you are happy with the design of your bookmark place it inside a sheet protector or even a ziplock bag might work (whatever you have at home). And add as much glitter confetti as you like. 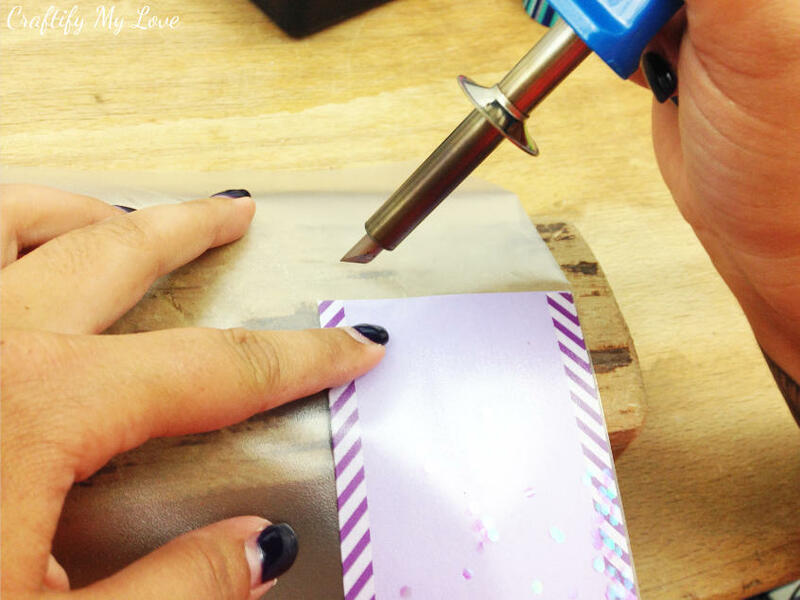 Using the fuse, you’ll be sealing the glitter pocket shut. Normally you’d use a little rolling fuse tool that I could not find. Arrrgggghhhh!!! It was one of those moments. So I had to make do with what I had at hand. I didn’t use the fuse on purpose as I wasn’t so sure about the reaction of the paper and the melting tool of the fuse. I used a hole punch instead. … and sealed the sheet protector around the freshly created hole shut with some craft glue. Why? 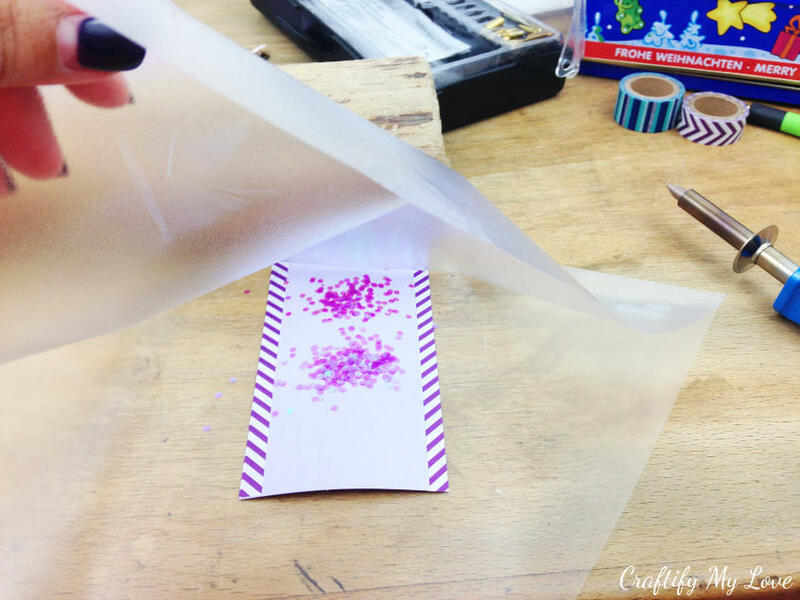 So you won’t find glitter sequins all over your house because of leakage. Add one or two pieces of ribbon in a matching color. I used a store-bought one on the left, but I recycled the ones on the right for free! Are you interested to know where I got them from? 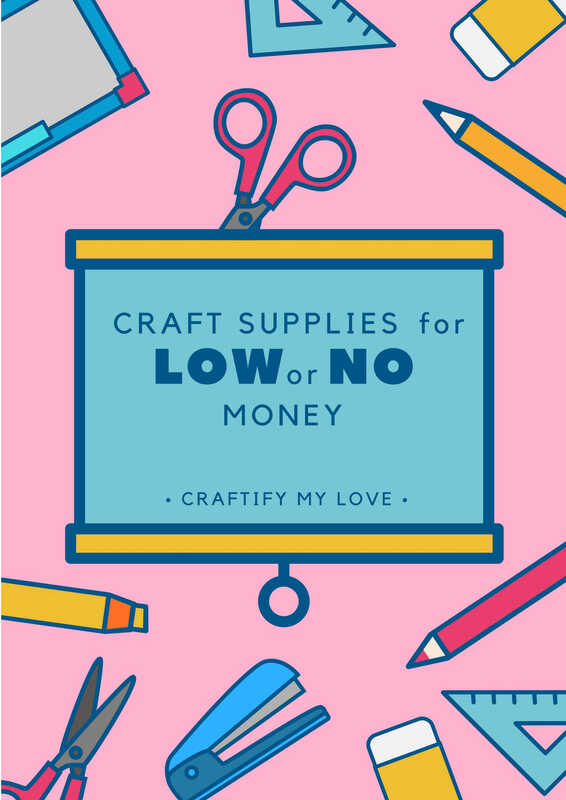 Then go read up about it in my FREE Guide to Craft Supplies for Low or No Money. 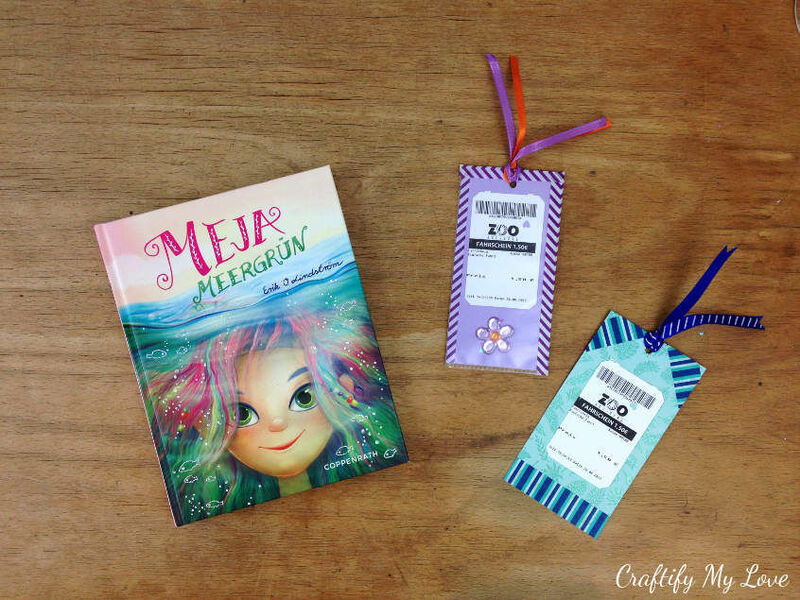 My god-daughters favorite summer book right now is about a little mermaid called MEJA. What is your kids favorite summer read? 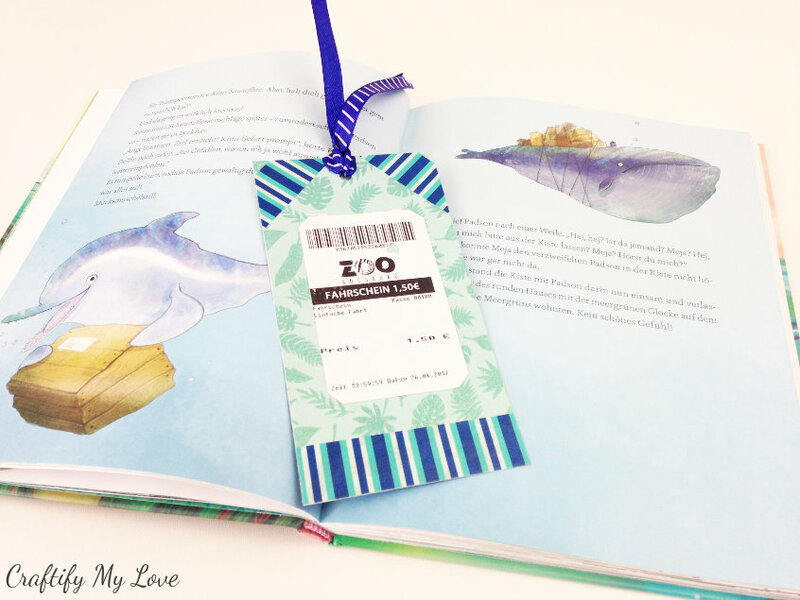 Why not learn how to make the blue & turquoise keepsake bookmark now? If you don’t have any tickets, but lovely photos you want to turn into a bookmark. Here is some great inspiration. Or get creative and come up with your own design? What supplies would you include? PS: Make sure to PIN this if you want to make it later. 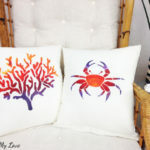 Crafting is fun but can be really expensive! 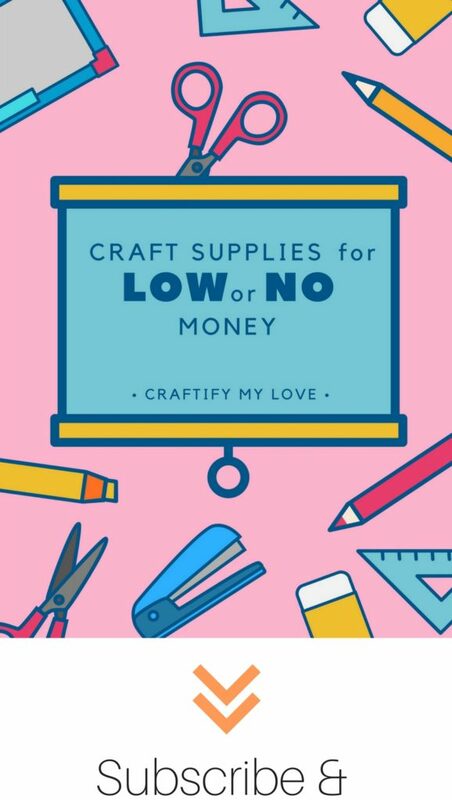 I wrote down many ways to save some serious bucks on craft supplies or even get the things for free. Grab your free copy today as a bonus by signing up for my newsletter. I’ll be shooting you a quick email whenever a new tutorial is up on the blog or I have some great new info for you. 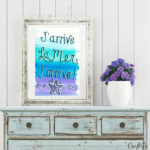 Next PostFree Summer Printable: J’arrive La Mer, J’arrive! This is such a fun way to remember an experience and I love it! My hubby and I save tickets to events we attend all the time, we have a jar just for that. I would have too many book marks but I am going to do this with the Grands this summer. It will help to reinforce their summer reading when their book marks are fun memories! Love this! Thank you Shirley! I think I saw done of your collection when we visited this May. Say hi to the grands when crafting. Omgee, we think alike. 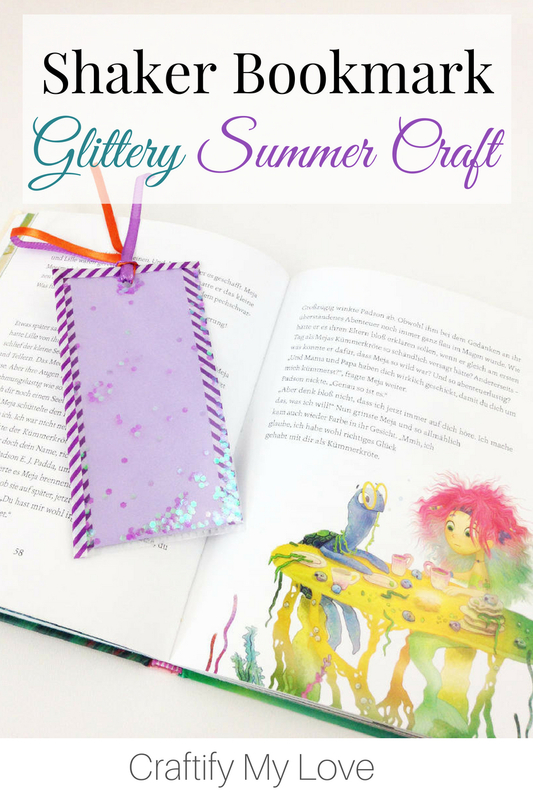 I planned on making shaker bookmarks with my girls this summer and already have the supplies to make them. 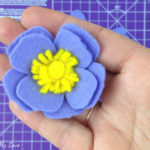 I think this is such a fun craft and is something that will get used. 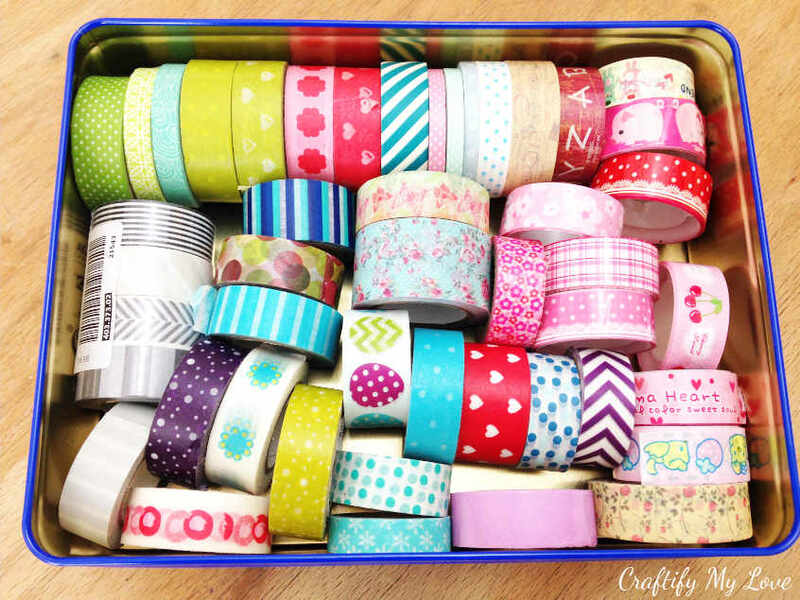 I love all your colorful washi tape! This is such a cute idea! No only does it preserve a memory but it encourages the kids to read because they’re going to want to use their new bookmark. I like that! I am happy you do! Thank you for letting me know.